Mike here. 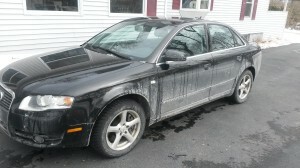 While everyone else is baking pies in honor of Pi Day (3/14), today I’ll give a nod to First World Problems and share a little about what a pain it is to work on my German luxury sedan, outside on a cold day. 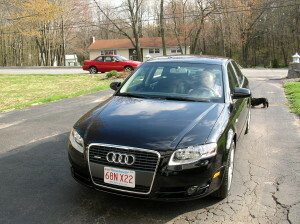 It’s a 2005.5 Audi A4 2.0T with a little over 142K on the odometer, and it’s been due for some attention lately. 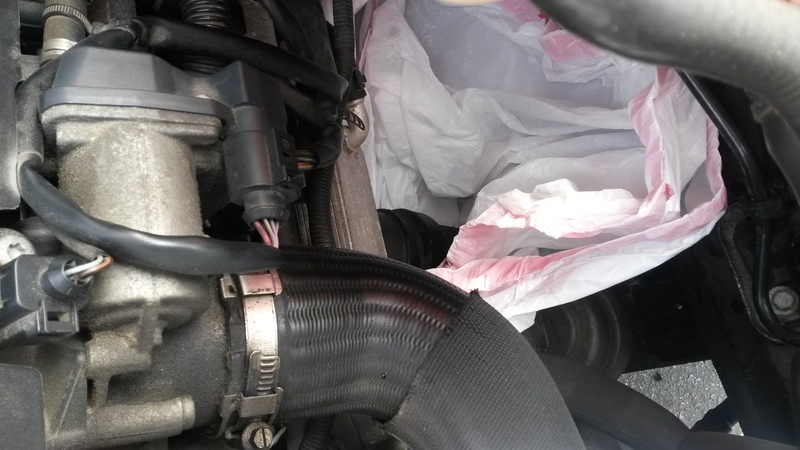 A little background – I’m a software engineer, not a mechanic, and this is a German vehicle, which means it’s unnecessarily difficult and expensive to work on. New vs today. If you look closely on the left picture, that’s Laura from Mangia Paleo behind the wheel from a long time ago! First, an oil change – Should be easy, right? Under the hood is Volkswagen-Audi’s first generation 2.0 liter 4-cylinder turbocharged direct injection engine, mounted longitudinally for the A4. 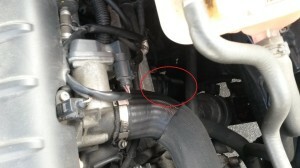 Among its many quirks is the oil filter canister, which is located at an angle in the lower part of the engine bay. Unscrewing it in this position would cause oil to spill out and run down the frame onto the ground. 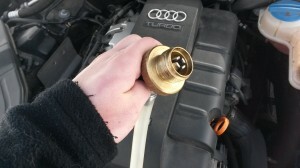 In what seems like an afterthought, Audi put a drain into the bottom of the canister and sells a $50 brass tool you’re supposed to use to drain out the canister and and allow you to then remove the canister without making a mess. 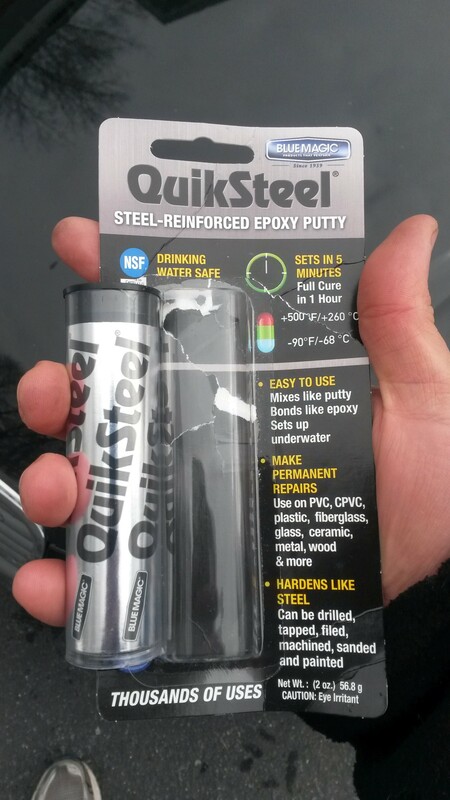 In the left picture is the drain tool, which unfortunately does not work on my canister. 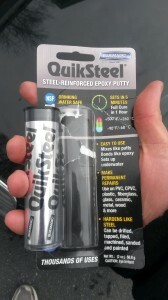 It doesn’t thread far enough in to engage the drain valve, and I don’t want to force it and risk cracking the plastic filter canister. In the right picture is my redneck solution, which is to put two layers of trash bag around the canister. 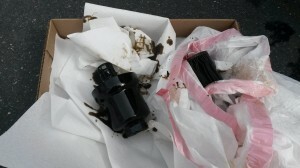 Then I just unscrew the canister and let it fall into the trash bag along with its oily mess. 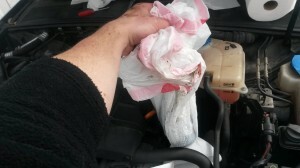 Then I just lift the bag up out of the engine bay – no oil spilled! The only downside of this approach is having to fish the oil-soaked canister back out of the trash bag to change the filter element. I’ve been doing this long enough to get pretty quick at it, so that even if the drain tool did work, I’d still prefer this method. 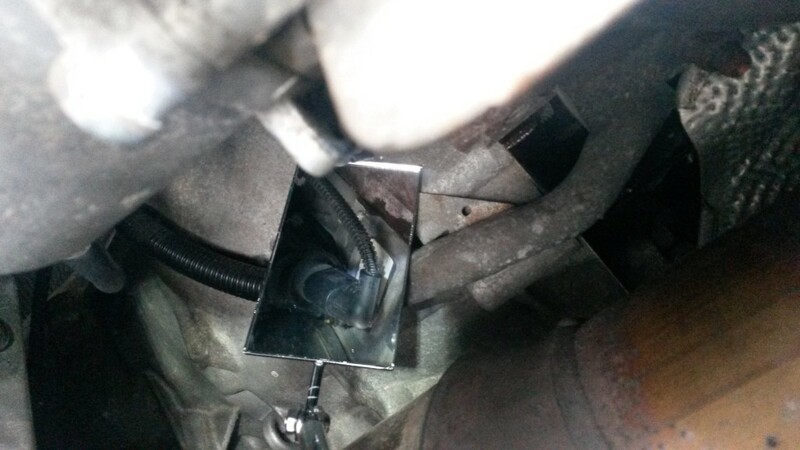 I use a vacuum extractor to get the oil out of the car through the dipstick tube – it’s very fast if done while the oil is warm, and saves me from having to lift the car. 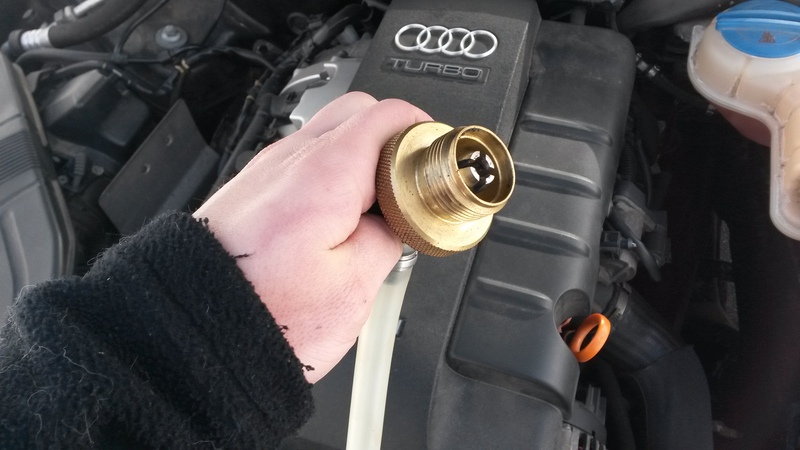 Also, Audi says to change the drain plug every time you remove it, which seems like an odd waste of drain plugs. So I won’t be touching the drain plug. Next I inspect the filter gasket for bits of metal – It’s hard to see in this picture, but that grit on the rubber gasket is actually little flecks of metal shavings from my engine. To say it’s not normal for oil to be full of metal shavings is an understatement, but luckily I know where they’re coming from and it’s been like this for years. This engine has a high pressure fuel pump that is driven off the intake cam. Due to some metallurgical design defect, the cam follower wears out. 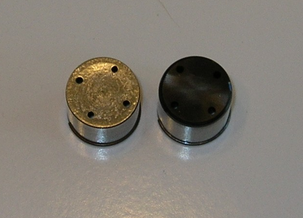 In the picture, the follower on the right is brand new, and the one on the left is severely worn – this was the first one I replaced, after about 70000 miles. 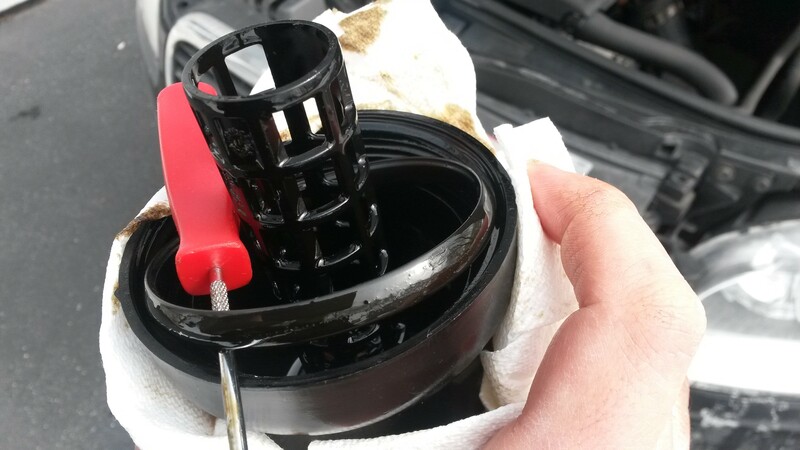 If it wears down all the way, the fuel pump piston destroys the intake cam and that is a very expensive repair. So now if I see the metal bits in my oil, I know to remove the fuel pump and check to see how the cam follower is doing. I’ve got a good trick for doing that too, which maybe I’ll put in another post – it can wait until it’s warmer outside. Next on the list is to do something about the little puddle of antifreeze I find under my car every time it’s cold outside. Some investigation and an inspection mirror leads me to a plastic flange in a really cramped spot at the back of the engine where a coolant hose attaches. 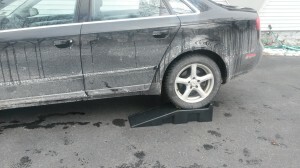 This has happened before during its first winter, and was fixed under warranty. Not yet sure how they did it – I can’t even fit my hand back there. So the leak will have to wait for nicer day as well. 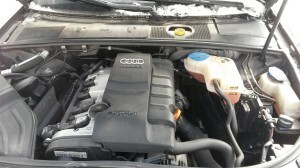 Today’s solution is to just top it off with the recommended G12 coolant and distilled water. 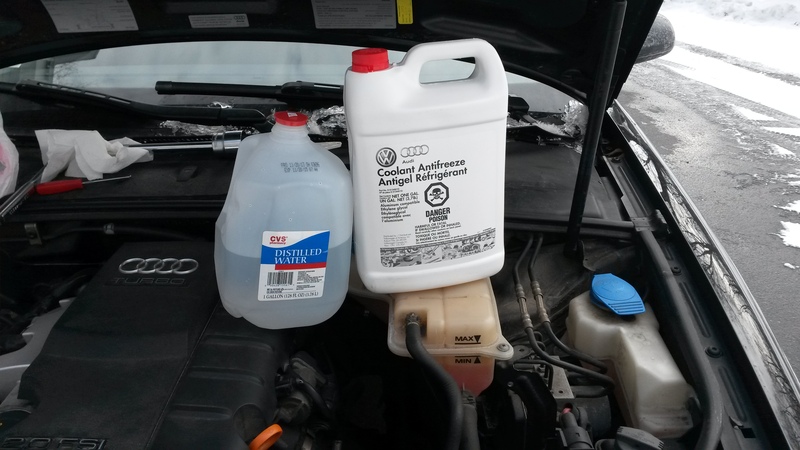 Audi warns that if you don’t use its $30/gallon coolant, bad things will happen. Since nothing on this car is cheap, I’ll play it safe. 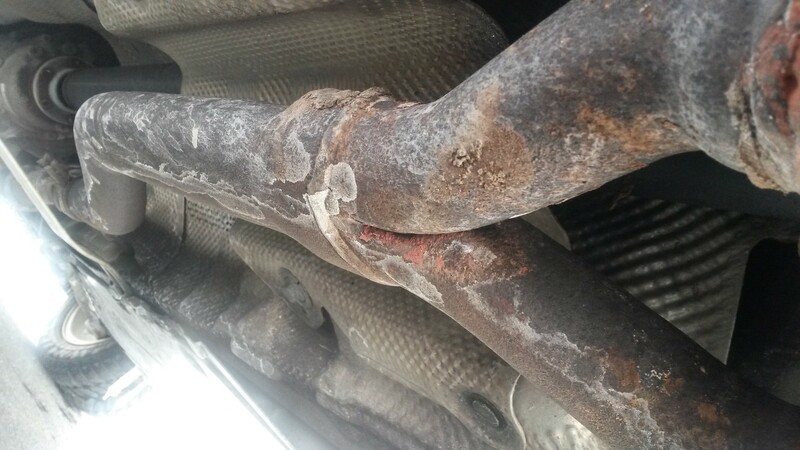 Next up, exhaust leak. It hasn’t really been bothering me that the car sounds like an 80 year old chain smoker gargling, but it’s too obvious to pass this year’s state safety inspection. Backed it up on some ramps to take a look – it’s hard to see in this picture, but there is a hole in the pipe right in the middle of the ‘Y’ where it splits. 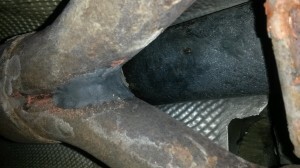 Nothing else looked too rotted under there, so I just cleaned up the pipe and patched it with some epoxy putty. That’s a lot less expensive than a new exhaust system. 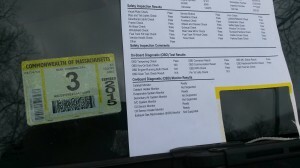 Well, it worked – Passed the inspection and got my sticker, good till after next Pi Day. If you enjoyed this post, let me know and maybe next time we’ll do a Swedish car. This entry was posted in Guest Posts and tagged a4, audi, automotive, car repair, cars. Bookmark the permalink. Well done. I would never attempt to do any of those things on my BMW for similar reasons of German engineers. I truly believe they have intentionally made their cars virtually impossible to work on as retribution for us beating them in the war! Well, pretty darned good for a software engineer. 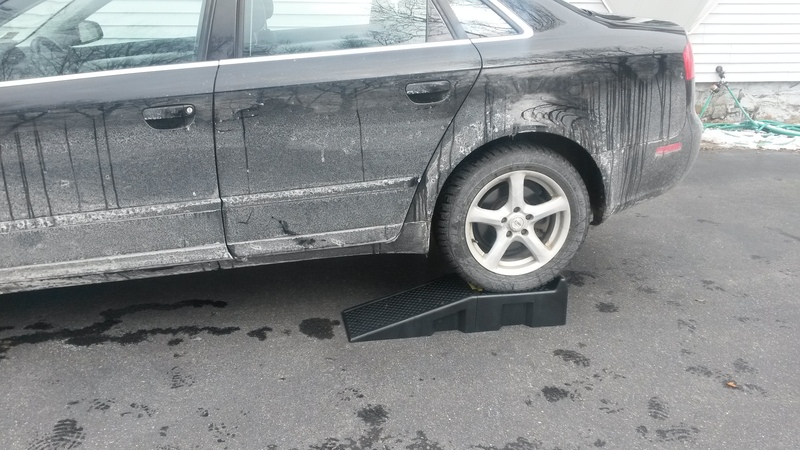 Your diagnostic skills and ingenuity make up for a lot! Annddd…. I’m pretty sure there are mechanics out there who would not be fixing things this efficiently! Kudos to you. 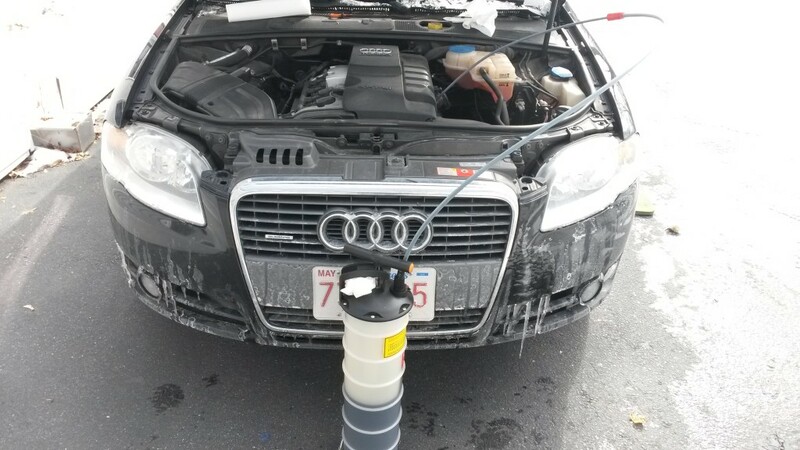 Audi mechanics are pretty efficient at this, but they charge like $125/hour. On jobs where parts alone cost hundreds of dollars, I’d rather try it at home!